It was more than just tax that was being evaded as the man who administered Rangers’ infamous EBT scheme was on the ropes while HMRC’s brief tried to hit him hard. It is easy to make seemingly outlandish claims about the years of wrong-doing by Rangers’ management while sitting on a stack of documentation. After all this time- and so many official claims of blissful ignorance- it is only fair to let you see for yourself. There are legal and tactical reasons for not just dumping everything for public consumption. However, ex-Rangers administrator and current TRFC Ltd Director, Andrew Dickson’s appearance before the First Tier Tribunal (Tax) on 18 April 2011 provides an opportunity for anyone with an interest in this story to get a cross-sectional view of the rot that rampaged through one of Scotland’s biggest football clubs in the first decade of this millennium. The document attached below is a verbatim copy- without editing or alteration- of the official transcript of Mr Dickson’s submission and cross-examination that day. It provides a quite detailed description of the how the trust scheme was supposed to work in theory. It lays bare the manner in which the sloppy implementation of the scheme by Mr. Dickson and his colleagues’ created gaping holes even in their “we-think-you-are-all-stupid” strategy. Just some of the evidence of deliberate concealment is in open view. It is interesting to see Mr. Dickson try to duck questions around player registration and the requirement to declare of all payments related to playing football. In defiance of logic, Mr. Dickson just sticks doggedly to his (presumably coached) lines of “we didn’t think we had to”. Had he endlessly answered “because We Are The People?” for a whole day under oath it would have made as much sense. It is quite a long read but worth the effort for anyone who wants to understand how the ailing mammoth that was Rangers ended up dying in a tar-pit of its own creation. It seems incredible to me that anyone aware of the facts would deem Mr. Dickson fit and proper for any current role in Scottish football let alone allow him to sit on SFA and SPFL committees. Mr. Dickson’s submission starts at the foot of the second page of the file. I have no copyright on this document. I note the document contains no claim of copyright. This document is provided here under reporting of current events provisions of fair dealing. Citing your source would be polite if you want to reference this content in any of your own reporting. The news BDO will seek leave to appeal the “Big Tax Case” (or the “so-called Big Tax Case” as many like to call it”) means this saga may yet have some twists and turns to it. Like many I yearn for the end of this process, but BDO do need to be seen to have exhausted all avenues to show an even handed approach to the interests of all creditors. Therefore news that they will seek leave to appeal is understandable. However, there are still many people who seem confused by what this was about. Myths have developed. Confusion reigns over whether Rangers’ conduct of the relevant tax cases is currently considered legal or illegal. Was it was tax avoidance or tax evasion, and so on. Most significantly, the campaign to have the farcical Nimmo Smith Commission findings set aside must be put on ice. 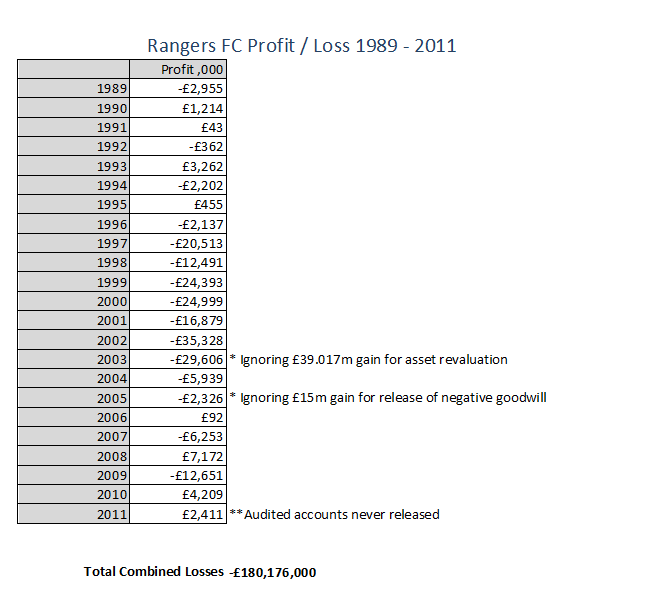 However, the context of the tax cases and what effect they had on the demise of Rangers can, and should be, discussed. To really understand this tale, and its impact on Rangers FC, we need to take another look at the ‘side-letter’ issue. For it was the decision to use, and then hide, these documents that lit the match that lead to Rangers’ self-immolation. Between 1999-2003, faced with a resurgent and share-issue funded Celtic, Rangers started seeking an edge by lowering the taxes it had to pay on players’ wages. This began with the operation of a Discounted Options Scheme for players. In essence this was a ‘money box’ operation and Rangers began what would become a pattern of lying/forgetfulness (delete as you think applicable) towards HMRC and violating the rules of the Scottish football authorities. Reducing wages in a player’s official contract would result in reduced PAYE and NIC taxes. The rest of his promised wage would be paid with little or nothing deducted for tax through an elaborate ruse intended to disguise the fact that employment-related pay was being channeled to players. Football had become a cut-throat business and an out-of-form or injured player could not rely on a handshake to ensure that he got his full promised pay. So Rangers provided players using this scheme with secret ‘side-letters’ that promised additional payment. Denying the existence of the side-letters was key to making the “Wee Tax Case” scheme appear to work. Lying/forgetting (delete whichever one you think is implausible) about the ‘side-letters’ was also key to the story of the “Big Tax Case”. It was this fundamental deceit/omission (delete as you see fit) regarding the ‘side-letters’ that would seal Rangers’ fate. The ‘Big Tax Case’ dealt with Rangers’ part of the Murray Group Management Remuneration Trust (MGMRT) that used Employee Benefit Trusts (EBTs) from 2001 – 2011. A Mr. Black, an important and influential figure at Rangers during the period when the EBT scheme operated, was reported as saying at the First Tier Tax Tribunal “So far as Rangers was concerned it enabled the Club to attract players who would not otherwise have been obtainable”. His reasoning seems pretty straightforward to everyone except the Scottish media and a cabal who appear to have been assembled by the SPL in 2012 to try kill off the idea of removing Rangers’ ill-gotten titles. Establishing Mr. Black’s identity and role in all of this would have been both important and trivially easy for the SPL’s Nimmo Smith Commission. Yet its findings overlooked Mr. Black’s submission. Some might believe this was regrettable. Like with the ‘Wee Tax Case’, the ‘Big Tax Case’ relied upon the use of secret ‘side-letters’ in a laughable attempt to create a “non-contractual” promise, in writing, of money in exchange for services. It would have required a revolution in legal thinking to have the ‘side-letters’ considered as being anything other than binding contracts. Therefore, their existence had to remain a secret from both HMRC and the football authorities. The ‘side-letters’ promised- often specifying appearance pay and win bonuses- money that would be paid into an offshore trust. From their sub-trusts, players could “borrow” money but, in reality, never repay it. With Rangers already ringing alarm bells for their debt levels and staggering losses during much of the affected period, the idea that more money would have been found to pay these players legally at the same level is just fatuous. There is no serious argument to be made that Rangers’ team would have been the same had they reduced the net paid to players by about 30% in some years. On multiple occasions after 2004, HMRC asked Rangers if such side contracts existed. The denials from the club were forthright and frequent. No such ‘side-letters’ existed. Accordingly, these binding contractual documents were not sent to the SPL despite player registration and eligibility to play in league games being conditional upon all documentation related to all forms of payment to players- including even legitimate loans- being submitted for each player. (SPL rule D1.13). The existence of the ‘side-letters’ would not be exposed until the City of London police raided Ibrox in July 2007 as part of an unrelated suspected fraud investigation that did not result in any charges. Heel-dragging and evasive responses on how Rangers were operating the scheme continued. For all the fuss and ink spilled discussing these subjects in the media, ‘the debate’ has always missed the significance of this issue. To understand the importance of hiding the ‘side-letters’, let us look at the counter-factual case of what would have happened if directors of The Rangers Football Club plc (as it was then known) had fulfilled their statutory duties to ensure that the club was compliant with its tax and regulatory obligations. We can start by looking at the “Big Tax Case” in isolation and consider that HMRC explicitly asked for an explanation of how the EBT scheme operated at the start of 2004. This was the first of several points where Rangers’ representatives missed a golden chance to remove any doubt over the legality of the way they were operating the scheme. Instead, they dissembled, misled, and withheld. Had they answered honestly and in full, Rangers would have been presented with a tax demand immediately. Certainly Rangers would have appealed the bill and a tax tribunal would have been scheduled. With fewer participants, and much less documentation, such a tribunal would have been conducted quickly. Even allowing for appeals, had Rangers not misled HMRC and the Scottish football authorities, the nature of Rangers’ use of EBTs and ‘side-letters’ would have been a matter of public record by late 2004. Whether the scheme would have been determined to be legal or illegal at that time is beside the point. If ruled to be legal, every other club in Scotland would have been free to copy the scheme and the sporting advantage would then have been lost in 2004. Any investigation of these matters by footballing authorities that ignored the difference in available information resulting from deliberately breaking the rules versus complying with them was not fit for purpose. Had Rangers’ use of EBTs been ruled to be illegal in 2004, the club would then have faced a tax bill of about £12m. While not trivial, this amount would likely have been found at the time from the club’s or the Murray Group’s then substantial credit lines. In 2004, such an amount would not have presented much of a threat to the club’s existence. More significantly the £35m that would be later paid in net wages by Rangers through the EBT scheme from 2004-2011 would have been either been cut roughly in half or the club would have gone into insolvency much earlier than it did. Rangers were straining financial credulity as things were. Paying the money owed and then grossing-up the EBT wages for every player was not an option. Better players would have had to have been sold to reduce the wage bill and to cover costs for those who could not be moved on. On 22nd May 2005, Rangers defeated Hibs at Easter Road to win the SPL by a solitary point with Nacho Novo scoring the only goal of the game. Every single Rangers player who participated in the game would receive payment through an EBT. Three transfer windows had closed since HMRC’s initial enquiries about the workings of the scheme. It is just blind denial to suggest that the same team would have been on that pitch that day had Rangers provided honest and complete answers to the initial information requests. Game after game. Season after season. The results were driven by the players on the pitch who in turn were induced to be there, despite some hollow claims to the contrary today, by the their total net earnings. What is absolutely clear is that the denial of the existence of the ‘side-letters’ gained Rangers a massive sporting advantage. Violating the SFA & SPL rules delayed the normal processes for determining the legality of the scheme. Violating SFA & SPL rules prevented other clubs from learning about the scheme through the normal tribunal process. However, the delay in revealing to HMRC how the scheme worked also set the financial trap that would make Rangers unworthy of investment. Additionally, the ‘Wee Tax Case’ would have been resolved over decade earlier had the workings of the scheme been revealed to HMRC on cue. In the spleen venting and venom spitting that accompanied Rangers’ collapse, anger and rage has been sprayed in every direction except where it properly belongs. Boards of directors are formed explicitly to provide oversight over those with their hands on cash register. A good seat for the game and a chance to network in the Blue Room are not good reasons to accept a directorship at any company. Yet Rangers fans, and a lapdog media, have not held a single director of the now in-liquidation Rangers to account for their actions or inaction related to these tax schemes. Two of them have been handed the keys to Ibrox again. It must surely have taken extraordinary circumstances for Dave King and Paul Murray to have been given so much trust on so little basis. Time will tell if the current wave of sycophancy towards a Rangers board is again ill-considered. One of the few mistakes we made in analysing Rangers during the last four and a half years was in over-stating the role of the “Big Tax Case”. During David Murray’s tenure as effective owner of Rangers, the club lost a sum in excess of £140m. (depending on whether you want to include accounting tricks for asset revaluation or not). None of it came from David Murray personally. He organised the finest Tom Sawyer “painting the fence” trick in Scottish business history and convinced many fools to pay for his bombast. The biggest fool of all was the Halifax Bank of Scotland (HBOS). About £70m of this incredible loss would be taken up by the bank directly or indirectly through Murray Group debt. (Though they would recover £18m of this through the sale of Rangers in 2011). The reality borne out of such horrendous losses is that Rangers were poised for collapse. After Lloyds effectively pulled the plug on the Murray Group credit lines on taking over HBOS in late 2008, it was just a question of when. The last years of automatic qualification for the UEFA Champions League group stages in 2009/10 and 2010/11 by virtue of being Scottish Premier League champions provided enough cash to stave off insolvency in those years. At the time Rangers’ Chief Executive Martin Bain warned “We must however take cognisance of the fact that Scotland’s diminishing European co-efficient means that there is no longer automatic qualification to the Champions League from the SPL or the significant revenues participation brings.” Defeat to Malmo in the qualifying rounds for the 2011/12 tournament meant no Champions League group cash would be heading to Ibrox that season. (We do not have time here to go into the many questions as to whether Rangers should even have been granted a UEFA license by the SFA to play in European competitions in 2011/12). The die was cast on the 3rd of August 2011. Craig Whyte’s tenure had barely begun, but insolvency was already guaranteed before the end of the 2011/12 season. With more than a hint of irony, Rangers FC were able to complete the 2011/12 season for a single reason: money destined for HMRC as PAYE, NIC, and VAT was used as working capital to pay wages and other bills that could not be delayed. Had the club paid its way on-time, insolvency would have occurred around late October 2011. It is highly doubtful that the club could have completed almost an entire season in administration. Certainly, it would not have been possible to liquidate Rangers and form a new club mid-season and pretend it was the same club. Selling Nikica Jelavic for £5m in January 2012 provided the money to fund administration and complete the 2011/12 season. It seems improbable that we would be having the ‘same-club’ debate today other than for Craig Whyte’s diversion of taxes to keep the show on the road. What role did the tax case(s) play in all of this? The most important point in this entire affair is that Rangers’ failure to disclose the ‘side-letters’ allowed the situation to build to a point where there would be no escape from the inevitable insolvency. The evasiveness over ‘side-letters’ meant that a CVA was always unlikely. The use of taxes collected in season 2011/12 as working capital just banged down the lid on the coffin and made liquidation a certainty. The window for saving Rangers was in 2004. With every passing season, David Murray’s reckless spending and his board’s failure to implement spending cuts, the tar pit that was waiting for Rangers just got deeper and stickier. Only in the past few weeks have we seen the emergence of a most gentle repudiation of the disastrous David Murray years in the Scottish press. Scottish football has been slowly recovering from the effects of trying to compete with Murray’s ways. Yet there are some in positions of supposed influence at Hampden who seem to be actively trying to recreate this period rather than ensure it can never happen again. This project began out of incredulity that the biggest story in the history of Scottish sport, the impending insolvency of Rangers FC, was not getting press coverage. This blog had one primary objective- stimulate a mainstream media discussion of what was really happening. That objective was achieved, briefly, in the summer of 2012. I thank all of you who contributed and assisted with making this possible. Sadly, any hope that the Scottish mainstream media would find redemption is long gone. Faced with crashing circulations and declining radio advertising rates, they have retreated to the comfort of familiar ways. If anything the press have become even more uni-polar and afraid to speak truth to Rangers’ often bellicose fans. It is perhaps unfair to criticise them on this last point from the comfort of anonymity. This is not a subject where people will be swayed by persuasive argument. Almost anyone who cares about these matters will already have a fully formed opinion that will now be closed to reasoning. So the arguments will continue to rage on into futile infinity. However, anyone who can still be objective would be able to see that Rangers died by its own hand. What should have been a moderately important tussle with HMRC in 2004 festered into a calamity by the actions and inaction of those who ran the club.